You only have enough to cover the next paycheck. You might be thinking to get a second job. Yes, you can do that but not everyone has the time and effort to do just that. So how can you save with only one main source of income? The solution is to change your mindset, start thinking that you can be rich, think that you can do it despite all the odds thrown at you. 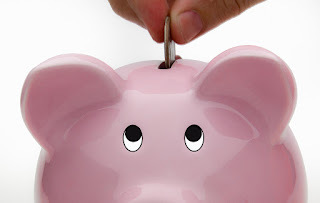 The basic formula of saving is: INCOME – SAVINGS = EXPENSES. Take note that this formula is fixed. Do NOT revise the formula to INCOME – EXPENSES = SAVINGS, that kind of mindset spells disaster. Why? because the EXPENSES part is a variable one, it increases when you still have the funds to spend. However, following the correct formula will force you to live within your means because of the constraints of having a limited budget. Now that you have the correct mindset and savings formula, let us go with the figures! Before you embark on your journey to get rich. You need to pay all your debt first. This will serve as your buffer when an "emergency" happens. The general rule for this is 3 to 6 months worth of your Monthly EXPENSES. Put this on a vehicle that is easily accessible when an emergency occurs, preferably an ATM. Just be disciplined enough though not to withdraw from it! Define also what is an emergency. Buying a new gadget because it is a sale or a plane ticket because it is a sale... It is NOT an emergency! Once you are done with the first 2 steps. You can then start building your wealth. Keep in mind that wealth is an accumulating asset. Meaning, you need to find a way on how to grow it. Using the bank as a vehicle is not a sound decision because the inflation rate is much higher than its interest rates. Some Examples of investment vehicles are the stock market, mutual funds, forex, government or treasury bonds, real estate, businesses. If you don't have any knowledge of these vehicles then use your SAVINGS fund to educate yourself. Attend Training, Seminars, Self Study. Invest in yourself and I assure you that the knowledge gained will benefit you in the long run. Most of the richest people in the world are also givers. They have charities that helped the less fortunate. They strongly believe that by giving, more blessings will come in order for them to keep giving and help more people. The formula is 10% of your SAVINGS. Example: 6000 (10%) = 600. Basically, any amount will do as long as you give it with an open heart. I am not limiting this to charities or other help organizations. You can also give this as your tithe on the church/congregation that nourishes you spiritually. The basic principle is you need to give in order receive. Keep in mind that this is not a quick rich scheme, there is no such thing as "quick" on the path of getting rich. Even winning the lottery is not technically quick, since you might be buying tickets many times before you hit the jackpot. The steps above will take time and discipline to accomplish and many hurdles will try to block your path. My advice is not to waiver, just keep at it. Be disciplined, and focus on the target. I assure you it will succeed. It is not about how much you earn. It is about how much you save. – Your Life In Perspective.